SEEDS Training is a trauma-informed professional development program for early childhood educators and care providers. 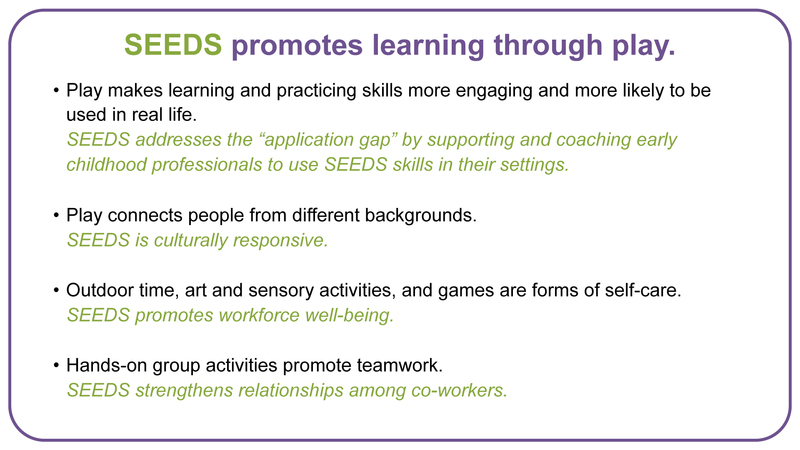 SEEDS helps professionals provide trauma-informed care so that children with histories of trauma can build healthy relationships and self regulation, both essential for school readiness. Session 1 focuses on building nurturing relationships with children. Teachers practicing Observation and Narration while making Nature Clay Sculptures. Session 2-5 focuses on helping young children develop self-regulation skills. Therapists learning to work with challenging behaviors through Mondrian Art Painting. Session 6 focuses on strengthening relationships with parents and caregivers. Supervisors practicing Facilitating Parent-Child Play with Water Beads Sensory Trays. Need more information about SEEDS?